A partial summary of the IMF’s work on inclusive growth (partial to my work). “There are, by now, several long term, time series data sets on important housing & macro variables, such as land prices, house prices, and the housing wealth-to-income ratio. However, an appropriate theory that can be employed to think about such data and associated research questions has been lacking. We present a new housing & macro model that is designed specifically to analyze the long term. Build a new data set and the users will come. At least that’s what my co-authors and I hope will be the case with this new data set on services exports that we released yesterday. More to come on this topic in coming days. “Supply-side bottlenecks need to be addressed to improve housing affordability and contain macrofinancial risks. Housing prices are very high, posing a vulnerability while disproportionately affecting low-income households. Reforms should improve municipal incentives for development, ensure adequate land privatization and urban renewal, shorten approval times and reduce construction costs. 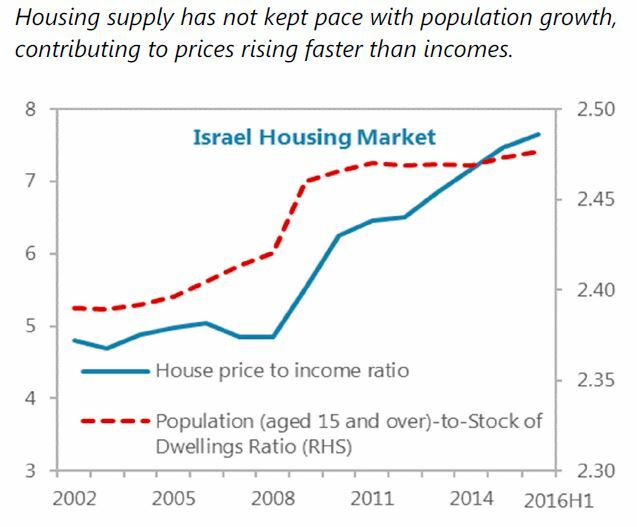 Macroprudential policies are appropriately tight and the Bank of Israel should monitor developments closely”, says IMF’s latest report on Israel. In this interview, Professor Malpezzi discusses housing patterns across countries, key progress and challenges in developing economies, “checklists” vs. “recipes” policies, housing supply in the US, his favorite real estate movies, and more. Stephen Malpezzi is Professor Emeritus, the James A. Graaskamp Center for Real Estate, Wisconsin School of Business, University of Wisconsin-Madison. Previously at the Urban Institute and the World Bank, he can be reached through his blog Real Estate and Urban Development Viewpoint. Hites Ahir: In a nutshell, how do housing markets work? Stephen Malpezzi: Let’s start with a schematic diagram (Exhibit 1) of the housing market. Inputs, such as land, labor, finance, materials, and infrastructure, are combined by supply-side agents, such as landlords and developers, to produce housing services. Homeowners, and to a lesser extent, renters, are also producers, because they maintain and upgrade their houses. Relative prices provide producers of housing services with information that helps to determine whether they should provide more or less housing, and whether input suppliers should provide more or fewer inputs. In many (not all!) countries, the market for housing services per se can be approximated as a competitive market. 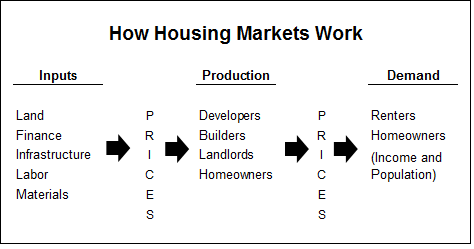 Housing production activities (the middle box in Exhibit 1) have few natural barriers to entry, or large economies of scale. In those competitive countries, few landlords or developers are large enough to exert significant market power. The market for many inputs may be less competitive. The ownership of land is often more concentrated. Large economies of scale may make the production of some inputs a natural monopoly, as with some types of infrastructure. Elements of the housing finance system may have economies of scale, imperfect information, and other barriers to entry and exit. Poorly designed government regulations could also, wittingly or not, restrict the competitive allocation of inputs, especially developable land. Many housing problems can be traced to low incomes, and need to be addressed by raising those incomes. Other problems in housing markets can be caused by problems in the input markets, especially land, finance, and in the regulatory and property rights framework of the market. To economists, the role of government in any market is to set the “rules of the game,” including property rights, and the legal framework, and to take actions – taxes or subsidies or regulation or occasionally direct provision – that attack so-called “market failures.” Besides the previously mentioned economies of scale and monopoly power, and poor (“asymmetric”) information, market failures can be due to externalities or spillovers. Housing related examples include increased traffic congestion, or water runoff associated with new developments. Extreme poverty can be analyzed as a market failure as well. We also have to be aware of the possibility of government failures. Just because we can cite an externality or other market failure doesn’t mean we’ve adopted a government intervention that improves the situation. Getting the regulatory environment right requires serious work to understand the size and nature of the market failures, and the effectiveness of the interventions proposed to mitigate them. The same can be said of any intervention – taxes, subsidies, setting the property rights/legal framework, or direct public provision. Hites Ahir: In your research, you have found that demand patterns are consistent across countries, but supply patterns are not. What explains this? Stephen Malpezzi: Housing demand is determined by, inter alia, income, prices, demographics, mortgage markets, and of course tastes or preferences. Let’s focus on incomes today, using Exhibit 2, taken from my work with Steve Mayo. These are called Engel curves, after the German economist who began the study of such budget shares in 1857. The horizontal line represents monthly household income in dollars. 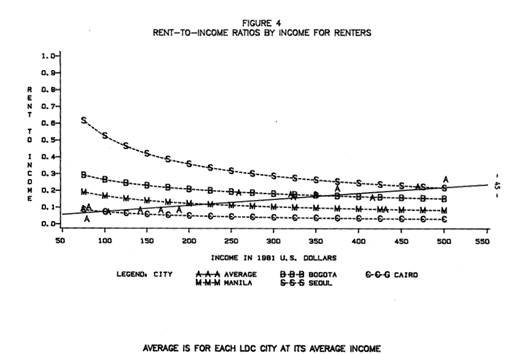 The vertical line represents the rent-to-income ratio, or budget share, at each income level. Based on analysis of household surveys, we can trace out the average rent-to-income ratio within each city at different levels of household income. Negative sloping lines indicate that rents rise more slowly than incomes (housing expenditure is income inelastic, in economist’s jargon). A flat line would indicate a constant rent-to-income ratio for rich and poor alike; and a rising line indicates elastic demand. Demand for housing within a market has been found to be “normal” which means that as incomes rise people consume more housing. No surprise there. But while expenditure on rents rises with income, these expenditures don’t generally rise as fast as incomes rise. Housing is inelastic with respect to income, or in other words a necessity. One immediate consequence of this (and a plethora of other confirmatory research) is that the common practice of adopting a single expenditure ratio as a threshold for so-called housing affordability is very much at odds with actual household behavior. Households around the world treat housing as a necessity; the fraction of income devoted to it systematically falls as incomes rise within a city. The bottom line about demand is not that it’s identical in all cities. Other things matter, some readily measured like incomes, prices, and demographics; some are harder to measure including cultural effects on preferences. Nevertheless, housing demand appears to be remarkably systematic and predictable, given a few key variables. Supply is more complicated. 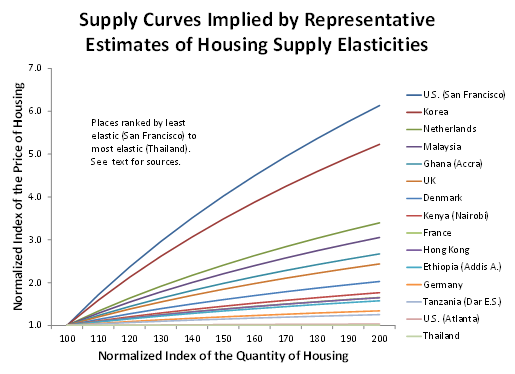 Exhibit 3, from a review I’ve just begun with Lingxiao Li, presents stylized supply curves for housing generated from the elasticities estimated by 6 studies of 15 different countries. There are many caveats about the strict comparability of these different studies, so think of Exhibit 3 as suggestive, not precise. Housing supply elasticities (responsiveness) appear to be all over the map. In cities like Bangkok and Atlanta, during the periods studied, small increases in housing prices begin to quickly call forth new supply. That supply can be from new construction; but also from upgrading and modification of the existing stock, through what is often called “filtering.” With these sources of supply working well, supply curves in these markets are flat. At the other extreme, cities like Seoul and San Francisco have low estimated price elasticities of supply. In these cities real estate developers and managers of existing real estate assets are constrained in some fashion, and slow to respond to initial price signals. Thus their supply curves are relatively steep. Why do these extreme differences in supply elasticities arise? Research across countries and across cities demonstrates that much of the variation is explained by supply side constraints, both natural (physical geography) and man-made (land use and development regulations). We have to live with geography, but we can change regulations. 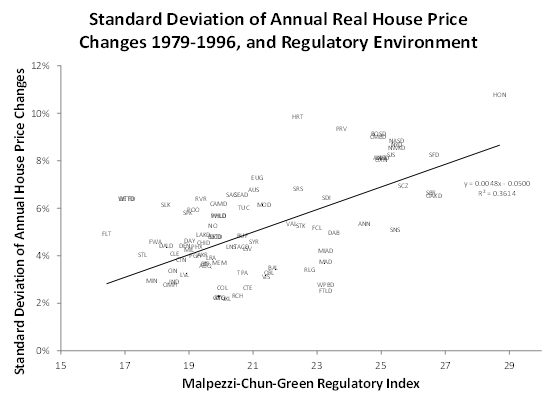 This leads to another central theme of housing research: Regulations have costs and benefits. Review both carefully. Hites Ahir: You have done a lot of work on housing markets in developing economies. In your view, what are some of the key signs of progress and challenges that remain in these economies? Stephen Malpezzi: Perhaps the greatest global progress comes from the simple fact that so many extremely poor families have seen their incomes rise, and their housing improve as a consequence. After that, housing economists and others can start by being Hippocratic: first, do no harm. We’ve learned that importing the design of institutions wholesale from developed countries may do more harm than good. Financial institutions, systems for public housing, regulations like building codes and land use regulations, all need to be designed in line with local conditions, based on evidence of their effectiveness. For example, in many countries, such evidence shows that the public housing model is self-limiting at best, can cause serious budgetary problems, and can lead to social strains as well. In some countries, programs of low-cost land development – so-called “sites and services” – can make a contribution, but details such as design standards and cost recovery matter greatly. Upgrading in place including basic infrastructure and rationalizing the layout of streets can be high-return yet relatively low-risk activities. We have learned a lot about housing subsidies for low income households, and many countries have put these lessons to work in practice. Both research and practical experience point away from bricks and mortar subsidies – i.e. subsidies directed towards housing units – and towards housing allowances, i.e. subsidies directed toward households. Just because more stringent land use and development regulations are associated with higher housing costs does not indicate that real estate markets should be completely deregulated. Appropriate planning and regulations can solve important coordination and information problems, and reduce negative spillovers or externalities. Concrete examples might include tackling traffic congestion and other tragedies of the commons, public health improvements from improved waters and supply and sanitation and so on. The test is whether regulation provides benefits in line with, or exceeding, the cost of that intervention. One particular challenge that many countries face is what is now often called the problem of the “omitted middle.” A good example is a case study of Malaysia undertaken some years ago by our World Bank team. The genesis of the study was that the planning ministry and others were concerned that Malaysia developers were focusing on the high end of the market and neglecting the middle market, despite a number of government initiatives to try to help them lower costs and move down market. When we find this problem, it’s a puzzle. We’d expect part of the formal development sector to move to the middle of the market, which is after all where the bulk of the potential profits are to be found. 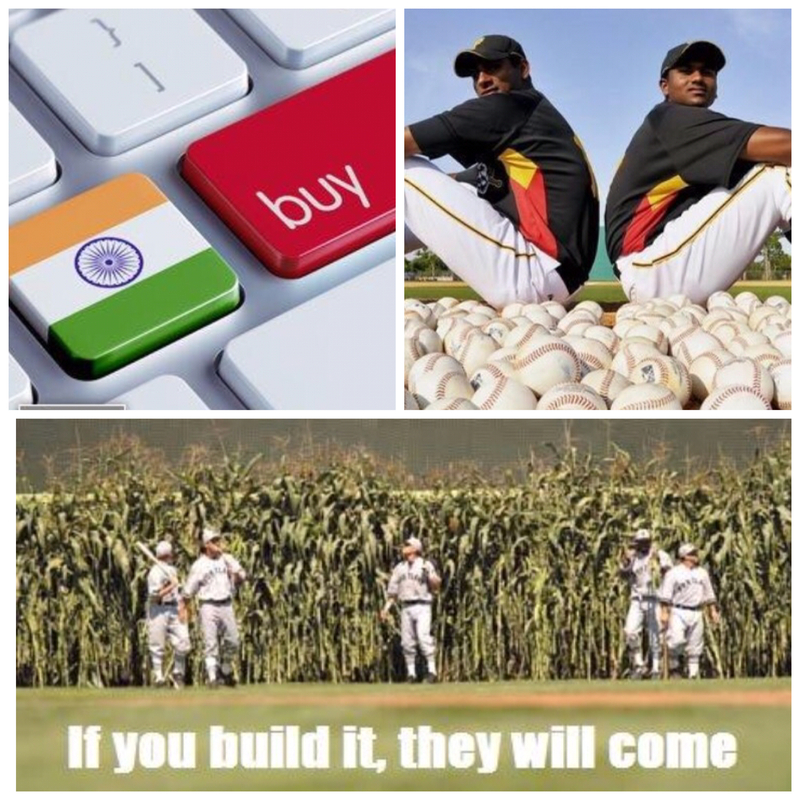 Analysis of this problem in Malaysia’s emerging market showed that it had little to do with labor costs or construction materials or even land prices per se, and much more to do with development regulations that had unintended consequences, that artificially tilted profitability away from the middle of the market. Some specific problems were easily spotted, such as an approvals process that required on the order of seven years to navigate for a plain-vanilla residential development, according to Malaysian developers’ own analyses. Other problems were a little subtler, such as large minimum lot sizes and required back alleys that almost doubled the required land for representative units. This problem of the omitted middle is very common, and not only in developing countries. Recently I read with great interest the posting on The Unassuming Economist about the work of the Center for Affordable Housing Finance in Africa. That interview provided a lot of data and discussion of exactly this problem. Even ignoring extreme cases like that of Angola, Kecia Rust and colleagues have shown that in a wide range of African countries the minimum cost house built by a formal developer often ranges between $20,000 and $60,000, which in the context of local household incomes puts them well out of reach of much of the market. Hites Ahir: When it comes to housing policies, you propose a “recipes” and “ingredients” approach. Could you elaborate on this? Stephen Malpezzi: I’ve been a big fan of checklists for many years: lists of the kinds of things that characterize a “good” housing policy, one that is efficient and equitable; or a list of the characteristics of a reasonable regulatory environment, that is, one that balances the costs and benefits of specific regulations under the market conditions that we face. Checklists have famously been given a big boost by Atul Gawande. But over time, as our lists grew, shortcomings of the checklist approach became apparent. Every country has a limited amount of expertise, financial resources, political capital and simply time to devote to housing reforms, or any other important project. How do we set priorities? A very long checklist can be a start, but by itself doesn’t set those priorities. So simple checklists might not work for housing policy quite as well as they might in surgery. Then I read a nice piece by Dani Rodrik about development “recipes” that suggested a different metaphor. If you accept the gustatory metaphor for the moment, consider that in housing policy as in restaurants we have “menus.” What “dishes” does the “customer” require? Improved property rights? A development industry that covers the “omitted middle?” More efficient and broadly available mortgage lending? Rationalized housing subsidies? Reform of land use and development regulations? Next within a menu, consider the necessary “ingredients.” For example, if we’re going to serve up a dish of improved property rights, we can think about ingredients as fundamental as what forms of ownership are permitted (leasehold, fee simple, various kinds of community property; cooperatives and/or condominiums and so on), and what they entail. Other ingredients can include important details such as the design of cadastral systems; how to transfer property interests; how to adjudicate disputes; and so on. “Recipes” explain how we tie the ingredients together. They are about process, and relationships. Recipes explain how to create and staff institutions, what sort of community participation and outreach are required. Good recipes consider equity and fairness as well as efficiency. Good recipes leave us with strong, transparent institutions. Where possible, the best recipes encourage competition; in areas where there are natural monopolies, such as infrastructure, the best recipes regulate appropriately. Good recipes are necessary for a good meal, but not sufficient; we also need skilled chefs and other kitchen staff. Housing and real estate require them too, or at least their analogues. Professional associations that not only improve technical skills, but also encourage ethical standards; and courses and schools that provide appropriate training and education are our Cordon Bleus. Don’t neglect the need to educate and train public officials: real estate development and management is a process that’s inherently political as well as technical and economic. Last in this list, but first in importance, we have customers. If they don’t like our food, or if our kitchen doesn’t produce appropriate, quality housing at reasonable cost, we will – or should! – go out of business. Time for some new chefs, some new recipes. Hites Ahir: For the past two years, several experts are saying that lack of housing supply is driving prices up. You have done a lot of work on housing supply. What are the main messages that emerge from your research? Stephen Malpezzi: Some of the messages that translate well across all countries are the effects that natural and man-made constraints can exert on housing markets. Whether you are in the U.S. or in China, or in France or Ghana, challenging physical geography, and challenging regulatory environments, can drive up costs. Demanding physical environments – mountains, bodies of water – can also provide security, transportation, leisure and aesthetic pleasure. Thus such geography can provide benefits that are also associated with higher housing costs. Appropriately designed regulatory environments also provide benefits along with their costs. It’s thus no surprise that research across countries, and across cities within countries, have illuminated the relationships among both natural and man-made constraints on housing markets, and supply elasticities. Examining U.S. housing prices and supply elasticities as a function of regulatory environments and physical geography as well as “the usual suspects” on the demand side instructive because the country has enormous variation across metropolitan areas in terms of both physical geography and regulatory practices. Exhibit 4 shows one of many examples, demonstrating that markets with more stringent regulatory environments average almost triple the price volatility than those with the simplest frameworks. More sophisticated econometric modeling undertaken in a range of countries confirms these findings. Hites Ahir: What can policymakers do to address regulation? Stephen Malpezzi: Effectiveness is not about the decision to regulate or not, or even some amorphous “quantity” of regulation, or about an ideology of “deregulation.” It’s about getting the details of regulation right. Overall, we need to apply the same kinds of cost-benefit analysis to regulation as we would to other government actions. What’s it cost? What’s it worth? Who pays for it? Who gets it? What’s it worth to them? Go back to the checklists – sorry, now recipes! Make use of research and experience in other countries. For example, planners in several developing countries concerned about “excessive” density and related road standards have been interested to learn of the high densities and narrow streets that can be found in some parts of Paris or even Boston, with no disastrous effects. Talk to planners and developers, on the ground. These local experts will help you to figure out where to focus attention and set priorities. They won’t always agree, of course. Sorting out regulatory costs and benefits will require some careful applied research. Alain Bertaud is a leader in this field, see his website. Land use and development regulations play out within cities. One approach is to dictate a set of codes at the national level. Perhaps a better way is to examine and modify the higher order incentives for the municipalities making and enforcing the regulations. For example, consider common rules that specify that narrow roads will be maintained locally, while wide roads are maintained by the national government. Surprise – local governments often set standards to encourage as many nationally maintained roads as possible, albeit at a large cost in land use and maintenance, raising the cost to taxpayers. Hites Ahir: You have also looked at the link between housing supply, regulation, and speculation. What did you find? Stephen Malpezzi: “Speculation” is one of those terms, like “sprawl” or “affordability” that economists dislike because it’s so value-laden and imprecise, but we are stuck with it. It’s common in many real estate markets with volatile prices to blame speculators for rising prices and decreasing “affordability.” Blaming speculators for rapid price increases is blaming a symptom not the real cause. Speculative demand – investing in a rising market in hope of riding the price rise to a quick profit, adding more fuel to the price rise – can only get started in a market that’s not elastic to begin with. Bill Wheaton showed this years ago, and Susan Wachter and I revisited the issue with a simple simulation more recently. Well-designed property taxes can play a role in cooling such an overheated market. But the real solution is to “elasticize” the housing market by reforming regulatory environments and other incentives. Hites Ahir: What got you interested in housing markets? Stephen Malpezzi: Serendipity. In the 1970s I was studying politics and economics while majoring in international affairs at The George Washington University. I needed a part-time job, and one of my roommates who worked for the Urban Institute’s Ray Struyk helped me get an interview, and I started working as a research assistant on housing market behavior, initially for Ray and later for Jim Follain. I had an empirical bent, and I enjoyed our work on the measurement and interpretation of house prices. The Institute was filled with other great colleagues, so I learned a lot. I also met GWU’s Tony Yezer, who became my PhD advisor when I switched over to economics. Later I was able to follow my international interests when I was hired to study housing markets at the World Bank, working with another great group of people including my collaborator Steve Mayo. I found housing and other urban development issues fascinating, something I was happy to study both in my home country and, when the opportunity presented itself, around the world. Eventually I found my way to the University of Wisconsin, where I found more excellent colleagues, including my coauthor Richard Green, and did more research on housing markets but also learned a lot about other kinds of real estate. Hites Ahir: As you look back on your 40 years of research on housing markets (and still going strong! ), what do you see as your biggest achievements? Stephen Malpezzi: That’s easy: finding great people to work with, who have a lot to teach me – then digging in and trying to hold up my end of the research. I think some of my price index work in my work on housing demand and housing supply turned out to be worthwhile. I learned a lot from the research I did with my colleagues Alain Bertaud, Larry Hannah and Steve Mayo on Malaysia, discussed above, that led us to analyze incentives in a simple but powerful manner and find a new way to talk about the omitted middle in housing markets. I’ve also enjoyed being able to integrate some history and political science, even a little psychology into my economic studies of real estate, particularly since I’ve been at Wisconsin. Hites Ahir: What topics in housing markets will be at the forefront in the next few years? Stephen Malpezzi: First and foremost, there’s a great need for data and measurement especially in improving housing prices. 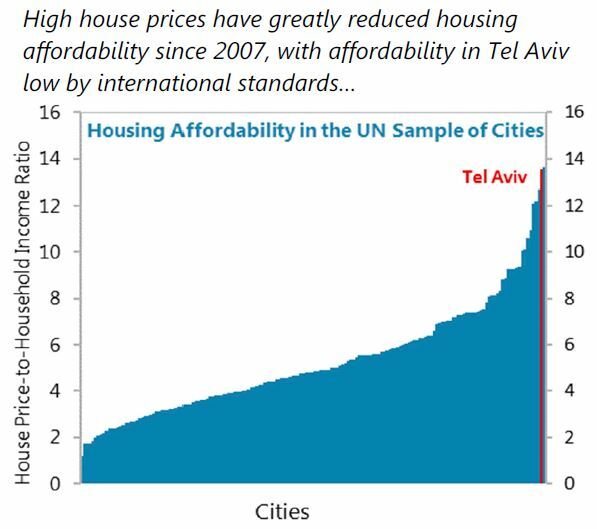 So it’s no surprise I’m a fan of the IMF’s Global Housing Watch. There’s much remaining to do in this area. Understanding housing markets requires a significant investment in the careful collection of data on prices and rents as well as measures of housing quantity and quality. Papers drafted for the World Bank’s Living Standards Measurement Survey provide one starting point for a detailed housing survey and its analysis. There is still much to be learned about the basic parameters of housing market behavior that underlie both efficient and equitable private markets and better public policies. Updated comparative demand work, and more careful analyses of housing supply, have already been flagged as research priorities. Some of the research my colleagues and I carried out was conducted a long time ago. How well do our results hold up today? With more and better data over time, can we improve the precision of basic results, and do more to understand the “deep determinants” of those basic market parameters? There’s a lot to be gained from improving the integration of housing and macroeconomics, as I’ve learned from colleague Morris Davis among others. A lot of “modern macro” models try to incorporate housing explicitly, motivated by evidence that housing often drives business cycles. But for tractability these “DSGE” models often adopt assumptions about supply and demand elasticities that are at odds with the best housing market research. How sensitive are the model results to these assumptions? Can we incorporate more realistic assumptions into these models while retaining a tractable structure? More research on the role housing plays in the distribution of income and wealth is essential. 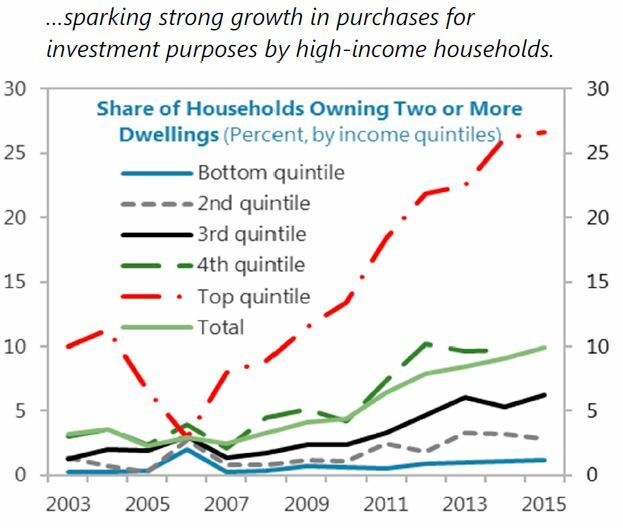 In most countries, after human capital, housing is the largest asset of most households. A focus on distributional issues in addition to economists’ usual focus on efficiency was a key contribution of the IMF’s former Chief Economist Raghuram Rajan. Other research has shown that the key empirical results in Thomas Piketty’s well-known book on distribution are driven largely by changes in housing prices. We’re sure to see additional research on a wide range of housing-related environmental issues, including energy conservation but of course also the broader development implications of sea level changes and changing weather patterns, especially since such a large fraction of the global population lives at or near sea level and at or near coasts. Hites Ahir: I hear that you always have very interesting stories to share. Is there any particular story that you could share with us? Stephen Malpezzi: If I may, let me recommend a great story by somebody else, economist Robert Gordon. He shows that well-functioning housing markets can provide many ancillary benefits, in his magisterial history The Rise and Fall of American Growth: The U.S. Standard of Living since the Civil War. In Chapter 4, Gordon has documented in detail how many of the 20th century’s advances in living standards – electrification, ample clean piped in water, modern sanitation, heating and cooling that make extreme climates comfortable, too many more to mention here – are bundled into improvements in housing size, quality and affordability. Today, in the U.S. most of us take these remarkable social and environmental improvements for granted. That does not mean there are not areas where we need to improve quality, as problems with lead-infused water in Flint and other U.S. cities highlights. To get a good sense of the problems faced by those at the bottom of the U.S. housing market, see Matthew Desmond’s Evicted. But fundamentally, I remain optimistic. While Gordon’s book discusses these issues historically and in my home country, I have no doubt housing-related improvements will play an important role in a wide range of countries over the coming decades. Hites Ahir: I also hear that you like movies, and that you had formed a movie club. You even wrote an article in 1999 called: The Greatest Real Estate Movies of All Time. Could you name 4-5 new movies that you would add to that article? Stephen Malpezzi: I love this question, partly because I haven’t seen many movies recently. Let me list several on my digital watch list. I’m on a bit of an Asian cinema kick, it seems. I’m about to watch Tokyo Story, Yasjujiro Ozu’s 1953 masterpiece about generational changes in a society under stress. The urban angle, of course, is the aging couple’s trip from the countryside for an eventful turn in the big city with their children. The central issue of generational divides is currently much discussed by real estate professionals around the world – will American millennials eventually marry and buy houses at the same rate as their parents? How will China (or Japan or Italy or Germany) house its growing cohort of older citizens, and who will provide and finance essential services? Salaam Bombay, Mira Nair’s 1988 breakout film following the street life of Bombay (Mumbai) children. A bleaker view than the more widely viewed, if perhaps more stylized, Slumdog Millionaire. 24 City is set in China, specifically the city of Chengdu. Jia Zhangke’s 2008 film centers around the redevelopment of a state-owned enterprise (SOE) factory into apartments. For something a little lighter, I recently saw the charming Secret Life of Pets with one of my grandchildren. An animated comedy for kids that adults can appreciate, particularly the highly stylized set of New York City, above and below ground. If I can switch from film to literature, I am about to re-read one of the all-time classic books about real estate, V.S. Naipul’s A House for Mr. Biswas. Like the author a Trinidadian of Indian heritage, Mr. Biswas finds himself navigating both the vicissitudes of Trinidad’s transition out of colonialism, and his more-or-less accidental marriage into the Tulsi family and the move into their large multi-generational home. Mr. B’s struggle to free himself and move into modernity are symbolized in this epic novel by his repeated attempts to build his own house and “go nuclear,” in the family sense. But Mr. Biswas is (literally, in the novel’s early going), cursed. Spoiler alert: things are not going to go entirely his way. But in the end, there is a house. If you want to call yourself a housing economist, I think you have to read this book. I should mention that in addition to my 1999 movie article, my friend Austin Jaffe at Penn State, who actually teaches courses on film, wrote a sequel. I hope we can collaborate someday and make it a trilogy. Hites Ahir: These days, what have you been up to? Stephen Malpezzi: I “retired” from the UW-Madison Graaskamp Center for Real Estate in May 2016. Note the quotes: I “retired,” I did not “quit.” Now I’m addressing my research pipeline, I’ve return to blogging, and generally indulging myself professionally. That includes some new work on African urban development, with Moussa Diop and Jay Sa-Aadu; analyzing China’s housing markets with Lingxiao Li; modeling U.S. housing prices with Yongping Liang; continuing my research on urban form with Alain Bertaud; and finishing the long-awaited second edition of A Primer on U.S. Housing Markets and Housing Policy, with Richard Green and Paul Carrillo. I maintain my links with Wisconsin’s Graaskamp Center; I’m working with Executive Director Michael Brennan on a paper entitled “Avoid These Common Mistakes in Real Estate.” (Hint: it’s turning out to be a longer paper than we first envisioned!) I’ll be blogging about New Jersey urban issues with Morris Davis and Julia Coronado at Rutgers’ Center for Real Estate. I also serve as the Dean of the Weimer School of Advanced Real Estate Studies at the Homer Hoyt Institute. Most importantly I find I have more family time, especially for harassing my three wonderful grandchildren. Despite its length, we’ve shortened this interview. Professor Malpezzi has posted more detailed explanations of the figures, reading lists, and other extensions to this shortened version at his blog, Real Estate and Urban Development Viewpoint.